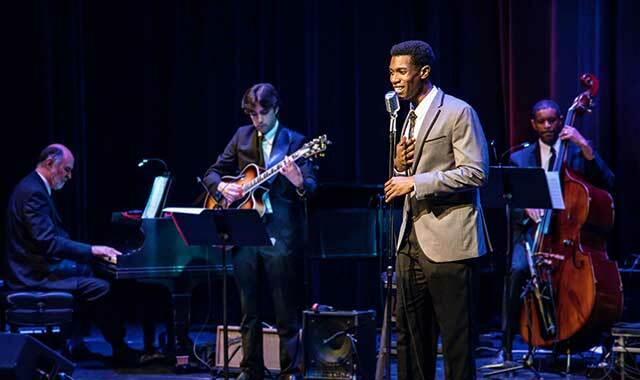 Join Evan Tyrone Martin at Aurora’s Paramount Theatre on Nov. 5, as he rekindles the sounds of Nat King Cole. Sept. 13-Oct. 29, see website for times. The hit musical chronicling the legendary recording session that brought together Elvis Presley, Johnny Cash, Jerry Lee Lewis and Carl Perkins. Paramount Theatre, 23 E. Galena Blvd., Aurora, (630) 896-6666, paramountaurora.com. Sept. 14-24, Th.-Sat. 7:30 p.m., Sun. 2 p.m. Bronwyn Bain’s estranged daughters arrive for a Celebration of Life, which may be poorly attended due to their mother’s disagreeable nature. Stage Coach Players Theatre, 126 S. 5th St., DeKalb, (815) 758-1940, stagecoachers.com. Sept. 14, 8 p.m. This high-energy, all-request sing-along brings your favorite tunes, from John Lennon to John Legend, the Beach Boys to the Beastie Boys. Raue Center for the Arts, 26 N. Williams St., Crystal Lake, (815) 356-9212, rauecenter.org. Sept. 16-17, Sat. 7:30 p.m., Sun. 2:30 p.m. The Elgin Symphony Orchestra opens its season with works by this beloved composer, including “Piano Concerto No. 1” and a premiere performance of Tchaikovsky’s “Suite No. 3.” Hemmens Cultural Center, 45 Symphony Way, Elgin, (847) 888-4000, elginsymphony.org. Sept. 16-Nov. 5, 11 a.m.-4 p.m. This juried, annual exhibit features works in all media created by artists residing within 50 miles of St. Charles. Norris Cultural Arts Center, 1040 Dunham Road, St. Charles, (630) 584-7200, norissculturalarts.com. Sept. 17, 5 p.m. Celebrating half a century in music, the singer invites fans to experience his re-imagined, intimate, acoustic versions of his most renowned songs. Arcada Theatre, 105 E. Main St., St. Charles, (630) 962-7000, arcadalive.com. Sept. 20, Oct. 18, Nov. 15, 7 p.m. Local performers, poets, dancers, songwriters, jugglers, etc., share their talents. Raue Center, Crystal Lake, (815) 356-9212, rauecenter.org. Sept. 21, 6:30 p.m. An evening honoring this Barrington-area visual artist. Musical entertainment by James Pedicone Band. Barrington’s White House, 145 W. Main St., Barrington, (224) 512-4284, barringtonswhitehouse.com. Sept. 21-Nov. 4, Th.-Sat. 7:30 p.m., Sat-Sun. 3 p.m. In James Laine and Stephen Sondheim’s fractured musical fairy tale, classic fairy tale characters get their wishes, with disastrous consequences. Metropolis Performing Arts Center, 111 W. Campbell St., Arlington Heights, (847) 577-2121, metropolisarts.com. Sept. 21, 8 p.m. Live sketch comedy and improv. Raue Center, 26 N. Williams St., Crystal Lake, (815) 356-9212, rauecenter.org. Sept. 22, 8 p.m. This alum of “Saturday Night Live” and “Second City” is joined by members of the Board of Comedy, who excel at improvising comedy sketches. Raue Center, Crystal Lake, (815) 356-9212, rauecenter.org. Sept. 22, 8 p.m. A genuine American treasure, and one of the final surviving connections to an historic era. Arcada, St. Charles, (630) 962-7000, arcadalive.com. Sept. 23, 8 p.m. In the only Lucas-approved “Star Wars” parody, Charles Ross single-handedly plays all of the characters, sings the music, flies the ships, fights the battles and condenses the plots into one hilarious show. Arcada Family Theatre at Pheasant Run, 4051 E. Main St., St. Charles, (630) 584-6300, arcadalive.com. Sept. 23, 8 p.m. Their timeless hits continue to please sellout crowds across the country. Arcada, St. Charles, (630) 962-7000, arcadalive.com. Sept. 24, 8 p.m. One of the most prolific American storytellers of all time, this writer and humorist is best known as the former host of the popular live radio variety show “A Prairie Home Companion.” Raue Center, Crystal Lake, (815) 356-9212, rauecenter.org. Sept. 27, 7:30 p.m. Step back in time to enjoy folk/rock classics by Bob Dylan and Neil Young, Joan Baez, Joni Mitchell, Judy Collins and others. Metropolis, Arlington Heights, (847) 577-2121, metropolisarts.com. Sept. 28, 6:30 p.m. This balladeer tells stories that alternately poke fun at and thoughtfully regard the human condition. Raue Center, Crystal Lake, (815) 356-9212, rauecenter.org. Sept. 29, 7:30 p.m. An evening of jazz and pop songs performed in an interactive, improvisational style. The Listening Room, Lakeside Legacy Arts Park, 401 Country Club Road, Crystal Lake, (815) 455-8000, lakesideartspark.org. Sept. 29, 8 p.m. Tom Glynn channels the music of Ian Anderson and Jethro Tull. Woodstock Opera House, 121 Van Buren St., Woodstock, (815) 338-5300, woodstockoperahouse.com. Sept. 30, 8 p.m. Versatile musicians bring the music of Elton John and Billy Joel to life, paying them the ultimate tribute. Woodstock Opera House, Woodstock, (815) 338-5300, woodstockoperahouse.com. Oct. 1, 1 p.m. Ellie Carlson relives the relationship between socialite Mamah Borthwick Cheney and architect Frank Lloyd Wright, recounting their romance and her murder by a domestic servant. Prairie Center for the Arts, 201 Schaumburg Ct., Schaumburg, (847) 895-3600, prairiecenter.org. Oct. 6, 5-8 p.m. This month’s art show features “Dangerous Lullabies III,” “The Refugee Portrait Project” and work by the Crystal Lake Camera Club. Lakeside Legacy Arts Park, Crystal Lake, (815) 455-8000, lakesideartspark.org. Oct. 6-22, Fri.-Sat. 8 p.m., Sun. 2 p.m. Entertaining your daughter’s new boyfriend and his parents is nerve-racking enough, but to top it off, your daughter is the ultimate princess of darkness and her beau is “normal.” Woodstock Opera House, Woodstock, (815) 338-5300, woodstockoperahouse.com. Oct. 6-29, Fri.-Sat. 8 p.m. Sun. 3 p.m.; Oct. 13, 7 p.m. The campy, gleefully gruesome musical with the carnivorous alien plant, based on the 1960s cult horror film. Presented by Williams Street Repertory (WSR). Raue Center for the Arts, Crystal Lake, (815) 356-9212, rauecenter.org. Oct. 7, 8 p.m. All-live tribute to the Fab Four by seasoned musicians who rank among top Beatles tribute bands. Arcada, St. Charles, (630) 962-7000, arcadalive.com. Oct. 7-8, Fri. 7:30-10 p.m., Sat. 2:30-5 p.m. Rich and Brandon Ridenour promise to bring down the house with a program of wide-ranging piano music, from classical to popular, jazz and novelty pieces. Hemmens Cultural Center, Elgin, (847) 888-4000, elginsymphony.org. Oct. 8, 4 p.m. Stir the soul with some foot stomping and hand claping as this multicultural ensemble shares sacred, inspirational and gospel music written by Carolyn E. Hollins. Prairie Center for the Arts, Schaumburg, (847) 895-3600, prairiecenter.org. Oct. 12, 7 p.m. Join WSRep actors for this monthly reading from selected themed classic and contemporary literary works. Raue Center, Crystal Lake, (815) 356-9212, rauecenter.org. Oct. 13-Nov. 5, Fri.-Sat. 8 p.m., Sun. 3 p.m. Follow one typical American family over the course of 30 years’ worth of holidays, family rituals and the occasional flare-up of old tensions. Steel Beam Theatre, 111 S. Main St., St. Charles, (630) 587-8521, steelbeamtheatre.com. Oct. 13, 8 p.m. Will “America’s Favorite Mystifier” from the TV show “Phenomenon” succeed at “stealing” a vehicle from DeKalb/Sycamore Chevrolet GMC and have it appear on stage? If so, audience members will have a chance to win the vehicle. Egyptian Theatre, 135 N. 2nd St., DeKalb, (815) 758-1225, egyptiantheatre.org. Oct. 14, 8 p.m. Re-creating the authentic sound of their great hits, this group came a long way from the Brooklyn basement where it all began in the early ‘60s. Arcada, St. Charles, (630) 962-7000, arcadalive.com. Oct. 15, 3 p.m. Debuting professionally at age 9, this talented violinist is an international performer with an energetic presence and powerful sound. Barrington’s White House, Barrington, (224) 512-4284, barringtonswhitehouse.com. Oct. 16, 2017, 7 p.m. When Adolf Hitler declares war on Europe’s avant-garde, a jaded Paris art dealer and a high-minded Berlin art student play a deadly game of bait-and-switch to save the life of a condemned Jewish artist. Raue Center, Crystal Lake, (815) 356-9212, rauecenter.org. Oct. 19, 6:30 p.m. This Barrington resident, a talented artist in watercolor, collage, woodcut and dance, exhibits a variety of her works. Musical performance by Jazz Pizazz. Barrington’s White House, Barrington, (224) 512-4284, barringtonswhitehouse.com. Oct. 19, 7:30 p.m. With a legendary career of songwriting and performing, Sedaka continues to inspire audiences around the world. Arcada, St. Charles, (630) 962-7000, arcadalive.com. Oct. 19-28, Th.-Sat. 7:30 p.m., Sun. 2 p.m. Enjoy your favorite moments from the classic film in this stage adaptation. Stage Coach Players, DeKalb, (815) 758-1940, stagecoachers.com. Oct. 21, 7:30 p.m. Whether you prefer the right wing, the left wing, or a buffalo wing, this comedy group is sure to rouse a few laughs with its political lampooning. Prairie Center for the Arts, Schaumburg, (847) 895-3600, prairiecenter.org. Oct. 27, 6-9 p.m. Enjoy a juried fine art show of all mediums. Crowds of art enthusiasts travel from all over Chicagoland and Wisconsin to view the artwork. The Starline Gallery, 300 W. Front St., Harvard, (815) 347-8535, nancymerkling.com. Oct. 27, 7:30 p.m. Treat yourself to a live performance of the entire Sgt. Pepper’s album; then the tribute band lads take you on a trip down Abbey Road with 20 of the Beatles’ greatest hits from all eras. Hemmens Cultural Center, Elgin, (847) 888-4000, elginsymphony.org. Oct. 28, 7 p.m. Join Schaumburg Youth Symphony Orchestra and “Dr. Bela Spookhausen” for a frightfully fun performance of Boo-thoven, Blech and Brooms. Prairie Center for the Arts, Schaumburg, (847) 895-3600, prairiecenter.org. Oct. 28, 8 p.m. Experience the emotional thrill of Bram Stoker’s gothic masterpiece in this elegantly horrific one-woman show by Megan Wells, resident storyteller, Chicago Symphony Orchestra. Woodstock Opera House, Woodstock, (815) 338-5300, woodstockoperahouse.com. DSO: Halloween Magic and Spells! Oct. 29, 2 & 4 p.m. Family concert with the Naperville Youth Symphony Orchestra, playing in costume. Music by Berlioz, Dukas, Tchaikovsky and John Williams. Wentz Concert Hall, 171 E. Chicago Ave., Naperville, (630) 778-1003, dupagesymphony.org. Oct. 29, 3 p.m. Experience Projeto Arcomusical, a world music sextet reimagining the Afro-Brazilian berimbau through original concert chamber music. Lakeside Legacy Arts Park, Crystal Lake, (815) 455-8000, lakesideartspark.org. Nov. 3, 5-8 p.m. November’s exhibit features Victor Farro, “On the Road” Studio 2909’s and resident partner artists. Lakeside Legacy Arts Park, Crystal Lake, (815) 455-8000, lakesideartspark.org. Nov. 3, 8 p.m. Andrew Grams and the ESO demystify the process of creating a masterwork, first using excerpts of this great piece, then playing the entire work. Hemmens Cultural Center, Elgin, (847) 888-4000, elginsymphony.org. Nov. 3-19, Fri.-Sat. 8 p.m., Sat.-Sun. 2 p.m. A big, green ogre who lives alone on a swamp tries to rid his land of fairytale creatures and, along the way, falls in love. Presented by TownSquare Players. Woodstock Opera House, Woodstock, (815) 338-5300, townsquareplayers.org. Nov. 4, 7-10 p.m. A family-friendly, Halloween-themed variety show filled with magic, juggling and comedy entertainment. Non-scary costumes encouraged. Raue Center, Crystal Lake, (815) 356-9212, rauecenter.org. Nov. 4-5, Sat. 7:30 p.m., Sun. 2:30 p.m. Featuring Beethoven’s “Symphony No. 7,” Aaron Copland’s “Our Town,” and the ESO premiere of composer James Stephenson’s “Tributes Concerto for Violin and Orchestra.” Hemmens, Elgin, (847) 888-4000, elginsymphony.org. Nov. 4-Jan. 14, 9 a.m.-4 p.m. Artist reception, Nov. 5, 1-3 p.m. Over the past 14 years, award-winner Carol Freeman has photographed hundreds of Illinois’ threatened and endangered species, with the hope of helping to save them from extinction. Lost Valley Visitor Center, Glacial Park, Ringwood, (815) 338-6223, mccdistrict.org. Nov. 5, 3 p.m. Chicago leading man Evan Tyrone Martin relates Cole’s musical journey, from his upbringing in the Chicago church through the jazz scene, to his emergence as a popular music icon. Paramount Theatre, Aurora, (630) 896-6666, paramountaurora.com. Nov. 9, 7 p.m. Join WSRep actors for this monthly reading from selected themed classic and contemporary literary works. Raue Center, Crystal Lake, (815) 356-9212, rauecenter.org. Nov. 9-11, Th.-Sat. 7:30 p.m., Sat. 2 p.m. Andrew Lloyd Weber’s beloved musical. Batavia Fine Arts Centre, 1401 W. Wilson St., Batavia, (630) 937-8930, bataviafineartscentre.org. Nov. 10, 2 p.m. Commemorate Veterans Day with the Temporal Brass Quintet, featuring American favorites from a span of eras as a tribute to the United States. Metropolis, Arlington Heights, (847) 577-2121, metropolisarts.com. Nov. 10, 8 p.m. Rock to hits such as “Evil Woman” and “Don’t Bring Me Down.” Arcada, St. Charles, (630) 962-7000, arcadalive.com. Nov. 10, 8 p.m. This actor, comedian and impressionist’s high-energy act includes observations, anecdotal stories and impressions of famous political, sports and celebrity personalities. Paramount Theatre, Aurora, (630) 896-6666, paramountaurora.com. Nov. 11, 8 p.m. “Ballet with a Twist NYC” combines Hollywood’s Golden Age with a sleek 21st-century sensibility in an original musical mix. Raue Center, Crystal Lake, (815) 356-9212, rauecenter.org. Nov. 16, 6:30 p.m. This Barrington Hills artist specializes in original oil paintings of nature and pets. Music provided by Barrington Music Institute. Barrington’s White House, Barrington, (224) 512-4284, barringtonswhitehouse.com. Nov. 16-19, Th.-Sat. 7:30 p.m., Sat.-Sun. 3:30 p.m. Performers explore the artistic attributes of ice, combining skating, sliding, aesthetics and acrobatic feats. Sears Centre Arena, 5333 Prairie Stone Parkway, Hoffman Estates, (847) 649-2270, searscentre.com. Nov. 16-19, Fri.-Sat. 7:30 p.m., Sun. 2 p.m. A hilarious holiday classic featuring Buddy, the full-sized elf, who travels from the North Pole to New York City in search of his real father. Children’s Theatre of Elgin, Hemmens Cultural Center, Elgin, (847) 888-4000, cteelgin.com. Nov. 17, 7:30 p.m. A world champion dancer, Yazzie and the dancers combine traditions of the Northern Plains and contemporary American Indians while introducing audiences to a wide spectrum of Native music and movement. Prairie Center for the Arts, Schaumburg, (847) 895-3600, prairiecenter.org. Nov. 17, 8:30 p.m. Lucy’s Comedy Café brings in regional and national comedians such as Dwayne Kennedy, Rocky LaPorte and Patti Vasquez for a night of laughs. Raue Center, Crystal Lake, (815) 356-9212, rauecenter.org. Nov. 17-18, 7:30 p.m. The longest-running solo play in Broadway history reveals, with laughter, the misunderstandings between men and women. Metropolis, Arlington Heights, (847) 577-2121, metropolisarts.com. This entry was posted on Tuesday, September 12th, 2017 at 11:59 am	and is filed under Arts & Entertainment. You can follow any responses to this entry through the RSS 2.0 feed. Both comments and pings are currently closed.